Turns out DMV is actually a pleasant acronym in some parts of the globe. 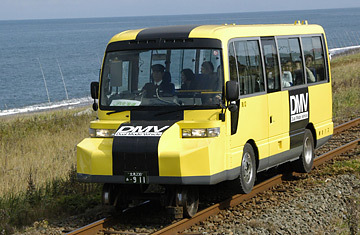 JR Hokkaido Railway Company began testing its Dual Mode Vehicle last April on a picturesque route along the Sea of Okhotsk in Japan's largest prefecture. When the perky yellow trolley runs out of rails in rural areas, it retracts its steel wheels and hits the road. The transition takes about 10 seconds. Initial demographic target: tourists.